This high purity fatty acid is ideal as a standard and for biological studies. Hexadecanoic acid is considered the most abundant saturated fatty acid in nature comprising 20-30% of the lipids in many animal tissues. Palmitic acid has been found to cause reduced insulin activity due to its mediation of PKC- activation in the central nervous system.1 During the metabolism of hexadecanoic acid it is converted to the omegahydroxy hexadecanoic acid and then to the dicarboxylic hexadecanedioc acid. Long chain fatty acids have been found to inhibit the double-stranded DNA binding activity of p53 DNA binding domain suggesting that fatty acids in the cell membrane might regulate the activity of p53 for cell division, cell-cycle checkpoint, and tumor suppression.2 Saturated fatty acids, such as palmitic acid, induce apoptosis in beta-cells which can lead to the development of diabetes.3 Long chain fatty acids acylated to sphingolipids are critical in many biological functions and substantial amounts are found to be amide-linked to the long-chain sphingoid base sphinganine, forming a ceramide, which constitutes the lipid backbone of sphingomyelin and other sphingolipids. Long chain fatty acids can often be found in esterified linkages with cholesterol, gangliosides, galactocerebrosides, sphingomyelin, and phosphatidylcholine. 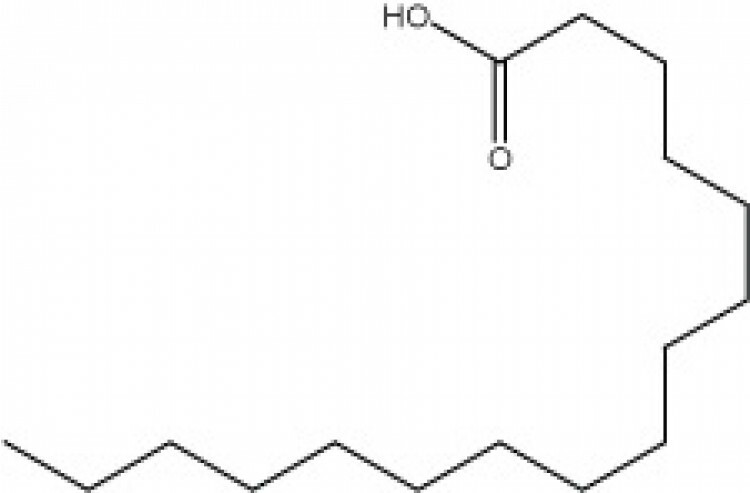 Hexadecanoic acid, as a saturated fatty acid, has been found to cause moderate risk of coronary heart disease as compared with polyunsaturated fatty acids but does not change the total cholesterol/high density lipoprotein-cholesterol ratio as compared with carbohydrates.4 Saturated fatty acids can also lead to the development of atherosclerosis in obesity and type 2 diabetes.